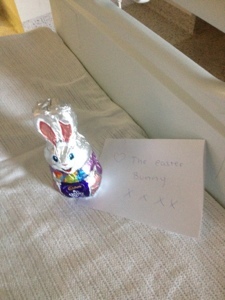 Easter bunny found his way to Orla at RCH this morning! Wishing everyone a very happy Easter. Orla has had a pretty good day today. She appeared much happier than she has for the past few days which is great. She doesn’t allow us to relax for long though as she spiked another temperature this afternoon. Not too high, by last weekend’s standards, nonetheless high enough that the covering registrar needed to review her and she had some blood cultures taken. Her temperature had settled back to normal almost by the time she went to sleep this evening so fingers crossed it stays that way…. We were planning on taking Orla out for a walk in her pram this afternoon. She has cells so from a transplant perspective we would be home if she didn’t have the setback of meningitis. The team are supportive of us taking her for a walk (outside that is) with a cover on her pram and preferably a mask on her face however there is no chance of that! Due to her temperature, we didn’t go out but we did some circles around her room and ventured out into the main area of the unit which she appeared to enjoy despite playing it very cool!! As much as we were disappointed not to be home for Easter, today is an exciting today to be at the Royal Children’s Hospital as the annual Good friday Appeal is on. There are a number of celebrities around and we have more chocolate than ever as well as some lovely cheeses donated to the cancer ward which the BMT unit is part of. There is a sausage sizzle going on outside on the lawn which we have full view of from Orla’s room. We are really experiencing the goodness of a great community here so if anyone is feeling generous go to: http://www.goodfridayappeal.com.au/ we can vouch that the money raised goes to excellent care! I was thinking this morning of the number of teams involved with Orla’s care and many of these will continue for many years to come. Just this week, there have been BMT, metabolic, infectious diseases, neurology, occupational therapy, nutrition, anaesthetics, theatre and medical imaging teams involved in Orla’s care. This morning we changed the anti-histamine Orla receives prior to her Cyclosporin. The one she was receiving was working the best of the 2 available options a few weeks ago and not making her drowsy but the nurse last evening suggested it might be now so we tried the other option available, it worked well and Orla does seem a little less lethargic. She has had a big sleep and has just woken now but is more alert and stronger. Her temperature seems to have settled completely and another of the IV antibiotics, Vancomycin, has been ceased today. She is on just one again now which will cover her in case she did have a bacterial meningitis. She is receiving some IV Magnesium and Potassium today as she has very bad diarrhoea which would have depleted her Magnesium and the antifungal drug she was receiving depletes Potassium. She still seems nausated and vomited this morning so is now receiving some regular medication for this which is probably due to a combination of the meningitis, the medication and the feeds…..
I’ve had some issues connecting to the internet again so apologies for the delay….thanks for all of the messages though. So back to Monday afternoon….there was much discussion going on between the teams…Ed and I were not keen on Orla having a general anaesthetic (GA). The BMT team strongly wanted her to have a MRI of her brain as she had a neurological episode plus it turned out they weren’t happy for her to have a lumbar puncture without a GA due to her scoliosis which could potentially make it difficult to perform….so we agreed to go ahead. She was second on the emergency list on the afternoon list for MRI – brain, CT scan – chest and sinus and a lumbar puncture. We waited and waited and then around 5:30pm we were told it was to be postponed till Tuesday as the child 1st on the list was running way over time and the anaesthetist wanted to do Orla in hours when they were more supports around. Tuesday morning came and Orla had a blood transfusion as her Haemoglobin was low at 71, this one of our concerns so we felt a little happier for the procedure to go ahead plus Orla seemed ever so slightly better on Tuesday. Orla was on the emergency list again that afternoon consisting of 3 children….all from the BMT unit, there are currently only 6 patients in here, so 50% were having an MRI that day!! We got the call to go down. There are 2 places where we could go and we were told the wrong one….by the time we got to where we needed to be Orla was quite unwell.There was no isolation area after so much effort taken in the BMT unit, there was a fire drill happening which was scaring Orla, her temperature was rising and when this happened her hands and feet were becoming very cold, her feet had turned almost blue and then the icing on the cake was the anaesthetist saying he wasn’t happy to go ahead as Orla was too unwell. Both Ed and I were very stressed, Ed had also strongly voiced our dissatisfaction of the fire drill….So what were we to do, we weren’t that happy about it but now the person performing it wasn’t either….We requested one of the BMT doctors to meet us, we understood their dilemma…How would they know which of the multitude of drugs was working if they had no real data, perhaps she was improving by herself and the longer she was treated the less likely they were to get the data as the drugs could have potentially destroyed whatever was causing Orla to be unwell. So we all had a chat, Orla had some panadol and calmed down and looked completely different, the anaesthetist felt happier so we were as happy as we could be , the procedure went ahead and went well and we were relieved to greet Orla in the isolation area of the recovery suite. The results have taken a little while….The lumbar puncture showed a high level of leukocytes in Orla’s cerebrospinal fluid (CSF), the fluid which surrounds the brain and spinal cord, indicative of a viral meningitis. However her CSF was also low in glucose and high protein which could indicate a bacterial infection….The MRI from what we have been told isn’t different from that performed in December pre transplant which is a relief. The CT scan didn’t show any evidence of a fungal infection. The CSF sample was sent to the lab to test for a number of viruses, all have been found to be negative although the one most likely cause, enterovirus, there was a muck with the sample so it couldn’t be tested!! So Orla has more than likely had a viral meningitis, although she has been on antibiotics to cover her against bacterial and she will continue on them for a few more weeks to be doubly sure. The IV treatment doses of antifungal and antiviral agents against the Herpes virus have been stopped and she has been changed back to the prophylactic doses all BMT kids get which is a relief as she practically having IV medications administered continually. Orla has had the IV nutrition recommenced this week and her feeds through her nasogastric tubes lowered as she wasn’t able to tolerate them. Today she was given a synthetic form of an IGg immunoglobulin to help her fight the infection as her immune system is so immature still. Orla has been sleeping a lot the past few days and is quite weak and flat when she is awake. We took her out into the main area of the BMT unit and let her look out the windows tonight and she seemed to perk up quite a bit. She seems to be nauseated and has needed some medication for this. Today has found her temperature under control without the use of regular panadol. This week has brought some nervous times for Ed and I. With the hopes of going home, the fall was even greater for Orla to become so unwell and we hope she recovers well from it. 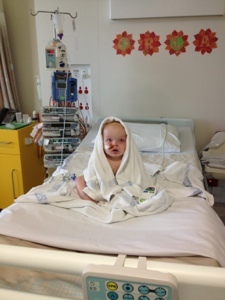 The plan for discharge hasn’t worked out as Orla spiked another temperature last evening and through the night. She has also been vomiting a bit too, probably due to the fever….or maybe due to increasing her feed volumes to prevent her losing more weight. We are hence staying put for the weekend and will hopefully go home on Monday. It really is best that we are here if she is unwell and its also best that we go home and not be readmitted…. Day +26 Did we speak too soon….!! Hopefully not!! But Orla had a very unsettled night last night and when Mum and I arrived in this morning both she and Ed were significantly over tired….! Orla had spiked a one off temperature of 38.5 degrees celcius through the night so she was recommenced on an IV antibiotic called Tazocin…. The doctors said they will keep her on it for 48 hours and cease it then which will be Thursday as long as her blood cultures don’t grow anything (which they haven’t yet) and they are planning for Orla to be discharged on Friday…. The other factor that might hold us up now is that Orla is losing weight….Her weight has dropped only very slightly over the past few days but nontheless she is going down rather than up or staying the same. She tasted some icecream and yoghurt today. It is a fine balance to stop the feeds so she regains her appetite without putting her at risk…..
Day +25 The H word is mentioned…. Yesterday marked the 5th week Orla has been an inpatient in the BMT unit. Today the doctors mentioned the “H” word, we thought it might be coming, the nurses have been throwing it around for a couple of days…! Yesterday Orla’s nasogastric feeds were scaled down from continuously running to having a break for 6 hours each day. This is with the hope that she may feel hungry and want to eat (she hasn’t taken anything orally for about a month now)….We are told this can be one of the greatest challenges especially in the younger children and having been through quite a lot to get Orla to eat the amount she was when we were admitted, the break has been rather nice or should I say the no pressure…It will not be straight back on, she is being transitioned to a more “normal” feed rather than the broken down peptide mix via her nasogastric feeds and we will be going home with a pump for her to receive feeds at home. She will also need to be administered all her medication except for cyclosporin via the nasogastric tube. She is currently receiving a Heparin infusion which is an anti clotting agent intravenously via her Hickmans line. This is to prevent something known as veno-occlusive disease and the normal protocol in the unit is to continue this until day 30 which is Sunday, so realistically I imagine it might be Monday next week before we head home but you never know!! There is a new nurse on the ward from Dublin (originally Roscommon, George) and she tells us they don’t use Heparin infusions there so maybe there is flexibility in the protocol…I will keep you posted. Orla is more and more her old self, sleeping for 10 mins only this morning and importantly happy most of the time! Hi there everyone, Happy St Patrick’s Day from RCH! Orla has had a pretty good day today. She has spent most of the day with Dad and enjoyed watching the Grand Prix and generally messing about. Mum has enjoyed some time out with a sleep in at home this morning and a movie this afternoon. The rash seems to have settled and is not coming on as much or strongly so fingers crossed this continues. We have managed to get the Cyclosporin down and keep it there for both doses today. She has a few vomits despite trying an additional anti-nausea medication. Ed offerred her beloved bottle to her but she wasn’t interested however she did taste some ice-cream yesterday…. Counts are looking good, with platelets (102) climbing by themselves, haemoglobin holding (94) and white cells (5.1) and neutrophils (2.5) climbing again since a drop, lowest being 1.54 yesterday, following Ganciclovir commencing and GCSF ceasing. There is a TV somewhere in the room….! !